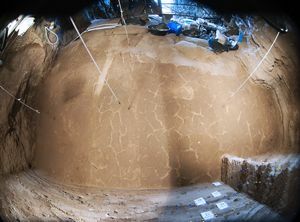 Excavation work in Vanguard Cave, the sister cave to Gorham’s, has yielded “spectacular” results that provide fresh insight into how Neanderthals lived. Scientists digging there over the past month have discovered several camp fires made by the Neanderthals, with stone tools left behind as well as remains of food eaten. The remains indicate that the Neanderthals who lived in these caves appear to have had a taste for shellfish in particular. Scientists have also found high-resolution climatic evidence of alternating periods of high rainfall and drought, including the dried up remains of several ponds over 40 thousand years old. “This degree of resolution is unique and is allowing scientists to understand past climate change in great detail,” the Gibraltar Government said in a statement. The annual excavation at Gorham’s cave begins next week and comes after a paper in the international journal PLoS One last month revealed that the site acted as a “mother cave” for the Neanderthals. The paper’s authors said other caves around Gibraltar, including Vanguard Cave, were visited for short periods, possibly while going for specific food resources like shellfish or ibexes. The paper, co-authored by a team from the Gibraltar Museum, the University of Queensland in Australia and the University of Oxford, looked at the stone tools made by the Neanderthals in the different sites around the Rock. The nature of the raw materials used, the type of tool made and the density in each site permitted the conclusions reached. The work also showed that the last Neanderthals retreated to home territory around Gorham’s Cave, where they would have felt at home, concentrating their activities close to the site. The paper in the journal also showed the importance of looking at Gibraltar as “a unique example” of a Neanderthal territory, the Government said. “Ideas to create a Neanderthal Park that would tell the story of the way of life of these enigmatic humans now receive further support from these latest findings,” it added in statement. Work is also being undertaken in parallel so as to have the site ready for World Heritage nomination in 2015. This work includes plans to repair the steps leading down to the site and to create a series of walkways that would permit access to limited and guided groups of visitors while not affecting the archaeological deposits themselves. Large items of metal and other rubbish that have accumulated on the beach as a result of winter storms will also be removed.